For over 650 years the Adnams’ family have brewed ale at The Swan Hotel in Southwold and in October 2017 they opened their doors to a wonderfully reinvented interior, and renovated exterior, by the extremely talented team at Project Orange who selected Nova Interiors to supply their bespoke furniture designs. Project Orange is an Architecture and Interior Design Studio set up by Christopher Ash and James Soane, a practice which excels in projects that seek a seamless marriage of architecture and interior design. 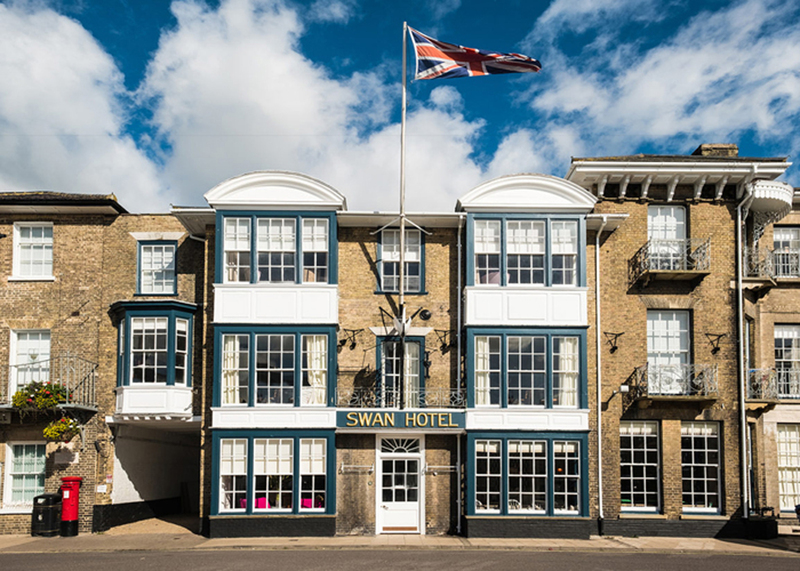 This is exactly what Adnams PLC were looking for to reinvent The Swan Hotel as the jewel in their crown, as the gateway to their brewery complex and as a premium coastal hotel with a vibrant food and drink offer. Project Orange completed the architectural improvements on the grade two listed building dating from the 1600’s which includes 35 rooms, welcoming drawing room and two restaurants, as well as the John Adnams visitor centre. The full interior refurbishment for Adnams balances the many original features with a textural neutral backdrop which is punctuated with rich, bold, blocks of vibrant colour. We love how this film, by Ember Films for Adnams PLC, captures the spirit of The Swan Hotel in their engaging Wes Anderson style. Working collaboratively with Project Orange, Nova Interiors supplied bespoke 4 poster beds with distinctive turned posts and vibrant bright pink details, beds ‘made for hibernation.’ We relish the challenges set by the interior designers who approach us looking for exquisite design led furniture. We manufacture customised upholstery, ranging from individual feature pieces to large quantities, in our Derbyshire factory. Our casegoods are produced by our exclusive production partner in Portugal. Our bespoke service was utilised by Project Orange for wall hung headboards which were designed using three varieties of Tinsmiths ticking in Navy, Duck Egg and Sky. We also supplied stools which were used at the base of the bed which we produced using Sunbury Lux in Vert, Android and Deep Space. A unique side table was designed to feature a thick 20mm diameter rope wrapped column to reference the hotel’s coastal location with both ash and oak construction variations. Thank you so much for your involvement in the Swan, it was a pleasure working with you on this.